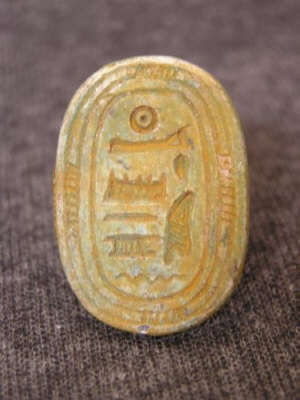 Sold on eBay by seller "G"
Faience Ancient Egyptian Hieroglyphic Seal Ring. Rare Ring in good condition despite repair done and small chip in bezel. Period: Egypt, 3rd Intermediate Period, Dynasty 25. Dating: 747 BC656 BC.Origin: Egypt, Upper Egypt, Thebes .Material: Faience. This is a wonderful Egyptian Faience ring in wonderful condition. The bezel of the ring shows a cartouch with hieroglyphics. The Eye of Horus is seen at the top. The ring is between 2.5 and 3" inches around to get an idea of sizing. I am guessing it to be between a size 8 and 9 US ring size. 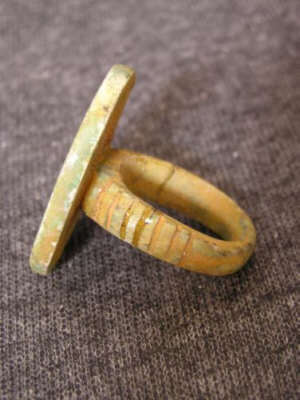 Rings such as this were used as seals stamped into clay or wax and only used by individuals of high importance such as Pharaohs, Viziers, High Priests etc. Rings such as this are in rare supply which gives this piece a high value! The details are truly lovely. This is in excellent condition. This bezel of the ring measures: piece measures 1 1/2" tall inches.